We are proud to announce the availability of PayPlans 1.4.1 Stable for download and upgrade. In this release, our major focus was on providing as number of integrations as we can with various components. Keeping customer's demands in mind, integration apps are provided with some enhancements in core features. Along with PayPlans 1.4.1 stable release, we promised you to launch App Ville in our previous blog. So today we are very much excited in launching App-Ville at our site. Take a visit. 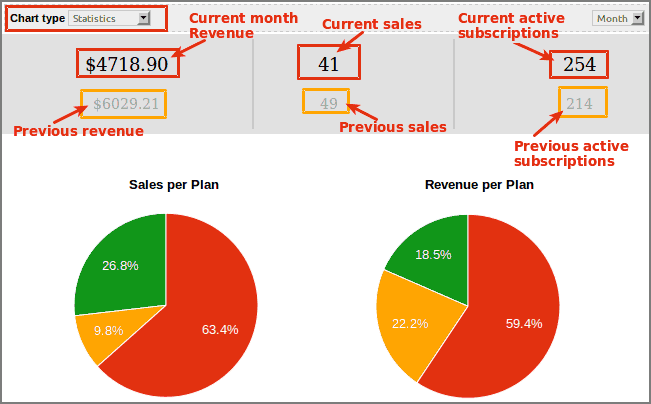 Added statistics chart on dashboard at backend : Now along with sales by days chart and revenue chart, you will have one more chart on dashboard at back-end i.e. statistics chart. Statistics Chart will help you in showing what is current status of your sales and revenue and what was the previous sales and revenue. Auto Delete Dummy Orders : You will find a setting in configuration to automatically delete dummy orders, subscriptions or payments after certain period of time. Here dummy orders means orders which are in "None" or "Confirmed" status i.e. orders created by user by selecting plan to subscribe but not completed the subscription process successfully. Change status of orders, subscription and payments from grid view : Admin can change status of user's orders, subscriptions and payments from respective grid view at backend. Now no need to edit each and every subscription or payment to change their status. Merged plugins Language files : All the language files of plug-ins have been merged into frontend language file. Now you won't find any difficulty in finding language file of every plugin as every string for each plugin will be available in a common frontend language file of PayPlans. Menuaccess app: It allows you to hide selected menus from users who don't have active subscription of respective plan. Moduleaccess app : It allows you to hide selected modules from users who don't have active subscription of respective plan. To know PayPlans in depth, follow our documentation section. We always appreciate feedback of our customers. Your ideas are most welcomed. So what are you waiting for? Go and get it now.